Kim Clijsters married American basketball star Brian Lynch in her hometown of Bree on Friday. The 24-year-old Belgian, who announced on Tuesday that she is pregnant, retired from tennis in May in order to focus on her private life. The civil ceremony was officiated by Bree's mayor, Jaak Gabriels, and took place at 6am. "This has been organised on the request from Kim, to keep the ceremony as low key as possible," said Gabriels. A statement on Clijsters' website added: "Kim chose the early hour because she wanted her marriage to be conducted within a small circle of people." 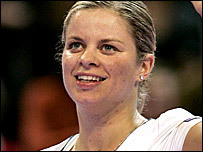 Clijsters, the US Open champion in 2005, called an end to her career in May, saying a string of injuries had led to fatigue and a lack of motivation and that she wanted to focus on her wedding and a new life with Lynch.